Two of classical music's most distinguished talents, cellistYo-Yo Ma and pianist Emanuel Ax, celebrate their musical friendship of 20 yearsin a thrilling, all-Beethoven program at UCLA Live. This event takes place at 8p.m. on Monday, Dec. 6, at Royce Hall on the UCLA campus and runs approximatelyone hour and 35 minutes. There will be one intermission. For tickets, call(310) 825-2101, visit http://www.uclalive.org/or contact Ticketmaster. With boundless inquisitiveness, energy and panache, cellistMa boldly has navigated vast musical territories — from the majestic vistas ofBach's cello suites to the Celtic fiddle traditions of Appalachia to thesoulful strains of the Argentinean tango and the intoxicating intersections ofAsian and Middle Eastern cultures along the ancient Silk Road. Throughout hisesteemed career, Ma has maintained a special partnership with renownedPolish-born Canadian pianist Ax. One of this era's most highly regardedmusicians, Ax has earned worldwide acclaim for his lyricism, unsurpassedvirtuosity and the exceptional breadth of his performing activity. Ma and Ax recently celebrated 20 years of collaboration witha recital at Carnegie Hall. Together they have earned three Grammy Awards andcontinue to tour together as they share a devotion to the chamber musicliterature. For their UCLA Live program, they perform the music ofBeethoven including 12 Variations in F-major on "Ein Mdchen oder Weibchen"from Mozart's "Die Zauberflte," Op. 66; Sonata No. 1 in F-major, Op. 5, No. 1;Sonata No. 4 in C-major, Op. 102, No. 1; Seven Variations in E-flat major on"Bei Mnnern, welchefhlen" from Mozart's "Die Zauberflte"; and Sonata No. 3 in A-major,Op. 69. The many-faceted career of cellist Yo-Yo Ma is a testament to his continual search for new ways tocommunicate with audiences, and to his personal desire for artistic growth andrenewal. 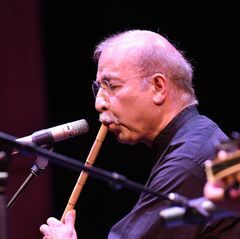 Ma maintains a balance between his engagements as soloist withorchestras throughout the world and his recital and chamber music activities.He draws inspiration from a wide circle of collaborators and each of thesecollaborations is fueled by the artists' interactions, often extending theboundaries of a particular genre. Ma is an exclusive Sony Classical artist, and hisdiscography of more than 50 albums (including 15 Grammy Award winners) reflectshis wide-ranging interests. "Obrigado Brazil," his 2003 recording of Brazilianmusic, won a Grammy Award for Best Classical Crossover Album. "Vivaldi's Cello,"a collaboration with Ton Koopman and the Amsterdam Baroque Orchestra, wasreleased in March 2004. Ma was born to Chinese parents living in Paris. He began tostudy the cello with his father at age 4 and soon moved with his family to NewYork, where he spent most of his formative years. Later, his principal teacherwas Leonard Rose at the Juilliard School. He sought out a traditional liberalarts education to expand upon his conservatory training, graduating fromHarvard University in 1976. Ma and his wife have two children. He plays twoinstruments, a 1733 Montagnana cello from Venice and the 1712 DavidoffStradivarius. Emanuel Ax isrenowned not only for his poetic temperament and unsurpassed virtuosity, butalso for the exceptional breadth of his performing activity. Each season hisdistinguished career includes appearances with major symphony orchestrasworldwide, recitals in the most celebrated concert halls, a variety of chambermusic collaborations, the commissioning and performance of new music, and additionsto his acclaimed discography on Sony Classical. Ax captured public attention in 1974 when, at age 25, he wonthe first Arthur Rubinstein International Piano Competition in Tel Aviv. In1975 he won the Michaels Award of Young Concert Artists and, four years later,took the coveted Avery Fisher Prize. He has been an exclusive Sony Classicalrecording artist since 1987, making his debut on that label with a collectionof Chopin scherzos and mazurkas. His recent releases include a two-pianoprogram (with Yefim Bronfman) of works by Rachmaninoff, period-instrumentperformances of Chopin's complete works for piano and orchestra and the BrahmsPiano Concerto No. 2 with Bernard Haitink and the Boston Symphony. Other notable recordings are a Grammy Award–winning album ofHaydn piano sonatas, the two Liszt concertos paired with the SchoenbergConcerto, three solo Brahms albums, an album of tangos by Astor Piazzolla and arecording of John Adams' "Century Rolls" with the Cleveland Orchestra forNonesuch. Born in Lvov, Poland, Emanuel Ax moved to Winnipeg, Canada,with his family when he was a young boy. His studies at the Juilliard Schoolwere supported by the sponsorship of the Epstein Scholarship Program of theBoys Clubs of America, and he subsequently won the Young Concert Artists Award.His piano teacher was Mieczylaw Munz. Additionally, he attended ColumbiaUniversity, where he majored in French. Ax resides in New York City with hiswife, the pianist Yoko Nozaki. They have two children together, Joseph andSarah. Tickets for Yo-Yo Ma & Emanuel Ax are available for $110, $90 and $60 at the UCLA Central TicketOffice at the southwest corner of the James West Alumni Center, online at http://www.uclalive.org/and at all Ticketmaster outlets. For more information or to charge by phone,please call (310) 825-2101. UCLA students may purchase tickets in advancefor $25. Student rush tickets at the same price are available to all studentswith a valid ID one hour prior to show time. This event is supported by the Evelyn & Mo OstinEndowment. UCLA Live is aninternationally acclaimed producer and presenter of music, dance, theater andspoken word, bringing hundreds of outstanding and provocative artists to LosAngeles each year. Lectures, residencies and extensive outreach programs expandthe impact of its unparalleled performances, which include a lively mix ofdistinguished masters and innovators from around the world. Committed tosupporting the development of new work, UCLA Live has presented both major andemerging artists including Pina Bausch, Kronos Quartet, Philip Glass, Bill T.Jones and Robert Wilson.